A good friend of Jochen Rindt, he competed in nine grands prix for BRM between 1971 and 1972. 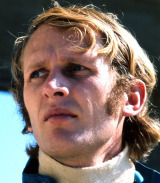 He achieved greater success in sports cars and won the 1971 Le Mans 24 Hours alongside Gijs van Lennep in a Porsche 917. The pair set a new overall distance record at the race which is still unbeaten (3,315.210 miles, at an average speed of 138mph). He also holds the all-time lap record at the legendary Sicilian Targa Florio race, having set a time of 33:41s in an Alfa Romeo Tipo 33 in 1972. His racing career came to an end when he was blinded in one eye by a loose stone piercing his visor at the 1972 French Grand Prix. He is a barrister and now works as a consultant to the Red Bull Formula One team and has close ties to its boss Dietrich Mateschitz.